Home Education Baynetwork Managed Services – The Answer to Your IT Problems? 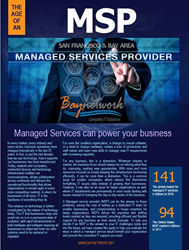 Baynetwork Managed Services – The Answer to Your IT Problems? Your focus is your business. Let us focus on IT and keeping it on track. In today’s competitive markets, finding necessary cost savings while maintaining the standard of service informed customers expect is a real challenge. The simplest approach for small and medium sized businesses has always been an in-house solution, after all, it would be difficult for any external solution to match both operational efficiency and cost effectiveness of an in-house alternative. That may have been true a decade ago, but today with technology advancing at increasingly rapid rates, maintaining the expertise and understanding required is a challenge for smaller in-house teams. This matters for all businesses, as the technological infrastructure is the backbone of business today, and providing the stability and reliability is crucial to daily operations. These changes mean that today, a manged service provider (MSP) like Baynetwork can deliver significant advantages for business beyond an in housed solution, and while at first glance the in-house solution may still seem the ideal answer, taking a closer look can reveal a very different outcome. Here we are going to look at some of the advantages of an MSP solution and how it can benefit business. Training is expensive, both in cost of the education itself and the lost productivity within a small team. An MSP delivers the skill set required at all times, taking the responsibility for continued updating of knowledge, education and training away from your business. This aspect of MSP performance is becoming increasingly important as technology continues to advance rapidly, along with it the need for constant skill maintenance and training. One of the challenges for small and medium sized businesses (SMB) with small in-house IT teams, as well as large enterprises with constantly changing IT infrastructure and upcoming IT projects is that IT requests are not consistent in volume. This is especially true as your business grows, where a team can become overwhelmed by the volume at certain times, leaving the business vulnerable. However, a managed service provider delivers the manpower required at any time, adding more trained staff as they are needed in times of high volume, providing seamless support as it is required. This approach allows for a flexible support system that would be almost impossible to match through an in-house solution. Without the need to employ additional staff for certain times, the MSP also begins to make sense from a cost perspective as well. In comparison to an in-house IT team, this flexible MSP approach also eliminates issues with sickness and holidays, where the in-house team may struggle to cover when shorthanded. The MSP solution provides the staff required at all times, dealing with the resource management issues and other situations as required. An MSP will liaise closely with your IT department to ensure that this support is provided seamlessly as necessary. Your team keep things running smoothly, that’s why you hired them, but if they spend most of their time doing that, you are missing out on their skills elsewhere. By offloading your support and network needs to an MSP, instead of spending all day dealing with emergencies and solving issues, the MSP will take care of things, freeing up your own experts to be more productive for your business. As we mentioned previously, the ability to cover for any eventuality in demand and resource requirements means that MSP solutions are extremely cost effective. In fact, they can provide worthwhile cost savings across the service, another being procurement. MSPs like Baynetwork can often build close relationships with vendors, and that in turn often delivers exceptional pricing agreements for software and hardware that would not be otherwise available for your business. This applies not only to initial purchases, but also ongoing supply contracts, EOL equipment, and other vendor expenses, which over time can add up to significant savings for your business. The advantages are clear, so the question is, why haven’t you taken the leap and hired Baynetwork, a managed service provider yet? Register today and receive our free literature that walks you through the advantages of MSPs, identifying the situation where and when an MSP fits your needs, and how much they can benefit your business, whatever its size. We show you how to reduce costs and improve IT performance. After reading our free brochure simply call (866) 941-8510 or email us for a free consultation.